The Confederation of African football (Caf) has agreed to delay some African Nations Championship (CHAN) matches in order to allow four countries from east and central Africa to take part in the Cecafa Cup. 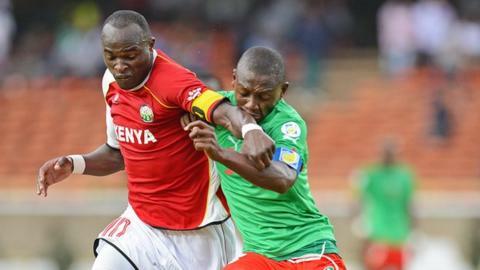 The first leg preliminary round matches Kenya v Burundi and Eritrea v Ethiopia have been postponed by two weeks. Instead of 30 November, they will now be played between 14-16 December. The return legs will take place two weeks later. The Cecafa Cup will be held in Uganda between 24 November and 6 December. Kenya, which has been at loggerheads with Cecafa over the staging rights of the Cup, said they would not honour the annual competition, but would instead prepare for the CHAN qualifier against Burundi. "For Kenya to take part in the regional Challenge Cup is not right. It will not improve our Fifa rankings because the tournament is not recognised by the world football governing body," said Football Kenya Federation (FKF) chairman Sam Nyamweya. "We have therefore chosen to focus on the Nations Cup because there is something at stake for us." However, newly-appointed Kenyan Sports Minister Ababu Namwamba overruled FKF officials, saying that Kenya, being one of the founder members of Cecafa, will take part in the competition.